HOLIDAY INN, 1942. Original Lobby Card (11” x 14” / 36 x 46 cm) Lobby Card starring Bing Crosby, Fred Astaire, and Marjorie Reynolds. Directed and produced by Mark Sandrich. Lyrics and music by Irving Berlin. Taking place in an inn that is only open on major holidays, a singer and dancer compete for the attention of a gorgeous woman who is trying to get her start in show business. Although all of the holidays are covered in this hit musical, it truly is a Christmas movie at heart, and launched the song “White Christmas” into Christmas stardom. 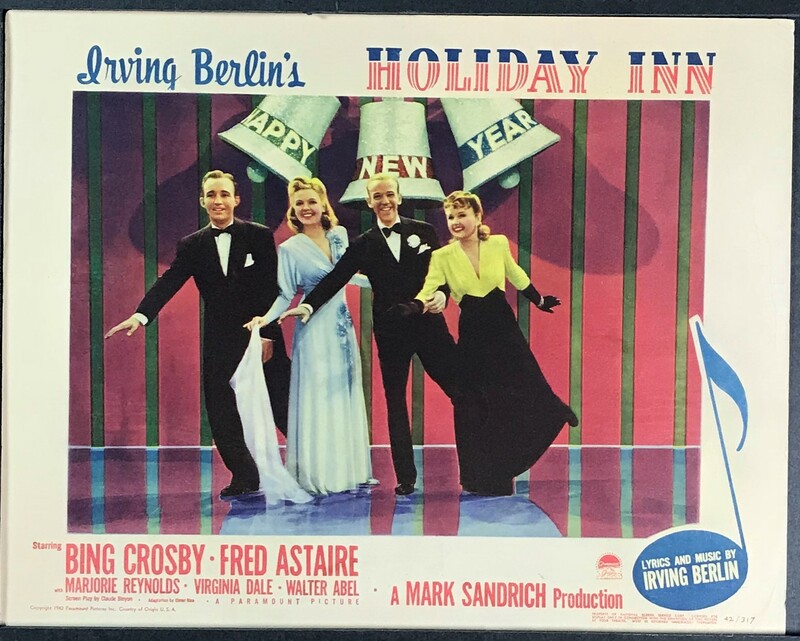 In 1943, Holiday Inn received an Academy Award for Best Original Song (“White Christmas”), as well as nominations for Best Score by Irving Berlinand Best Original Story.